Today, I was given a wonderful gift from someone in my extended family – i can't even tell you how we're related; it's one of those typically-Asian, tenuous, family connections, where you don't necessarily have to be related, to be related! 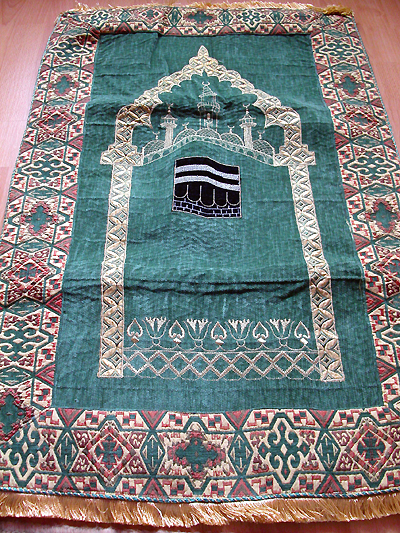 Anyway, it's a quilted prayer mat. Isn't it bayootiful, māshā’Allāh? Even the underside is decorated! 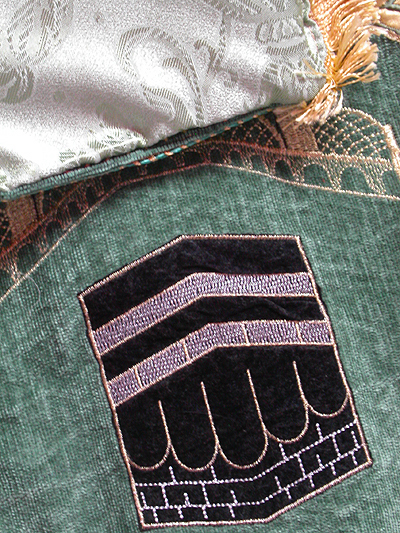 Now's that's attention to detail – who looks at the underside of a prayer mat?? Oh yeah, those people who turn the corners over, when they're done praying. I've never quite understood that idea, and seeing as i have never found any explanation for it from the Sunnah, i don't do it myself. That may seem like overkill, but some Muslims are so superstitious about this corner folding business, i don't want to copy them. I've seen people go around the entire prayer room, folding all the mats over, like they're on corner folding duty. I can understand if you folded the mat in half – maybe you want to keep it clean; but just one corner? I think that's a little odd (and at least one other person agrees with me). Please correct us if we're wrong! They say giving gifts increases the love between people – and i am loving my gift! Jazakallah random, uncle-type person!